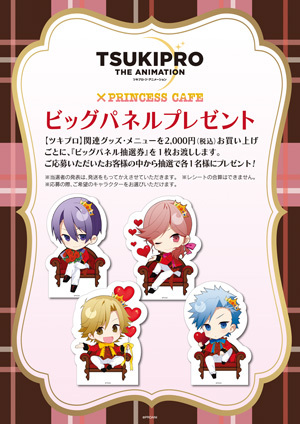 During this collaboration a special campaign will be held for customers who spend over ¥2,000 on TSUKIPRO THE ANIMATION collaboration food & goods! 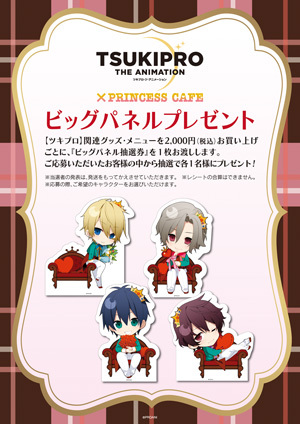 When you reach the purchase target you may select 1 of the 17 cardboard cutouts used that the café shown below. Once the collaboration comes to an end a lottery will be held and the winners of each cardboard design will be mailed their prize. While not specifically stated: Japanese residence held at the time of mailing may be required to enter in this campaign lottery since prizes will be mailed therefor it is advised for short term visitors/tourists to not enter this lottery unless they have a consistent address they are staying at from the time of entering the lottery and when the winners are selected & prizes mailed. Customers who visit and order off the food & drink menu will receive an original coaster (1 out of 17 designs) for free at random per order while supplies last. This collaboration will be held at 4 location(s) around Japan. Please be sure to verify the date, time, location, and reservation status of the café closest to you before visiting as these details may differ from location!